My grandmother passed away late last summer. In cleaning out her things, my aunt found some knitted wearables I made for her and returned them to me. I am wondering what to do with them. These are not colors I would wear and it seems a little off-putting to re-gift them to someone else. I might end up donating them to our local Thrift Shop, so at least someone will have the use of them. Meanwhile, they evoke fond memories when I see them in my completed projects drawer, so I might need some time before giving them away. I’m a sucker for novelty yarn. At least I now delude myself that I have a project in mind when I purchase it. Meet Bernat Maker Home Dec, available from Michaels. The photo below shows color clay and Pebble Beach Variegated. Composition is 72% cotton and 28% nylon. Kind of reminds me of t-shirt yarn, except more substantive. This is a made-up pattern that *probably* will fit the intended pillow. I didn’t want the knitted fabric to be too saggy, and it stretches a far amount. Simple seed stitch over 57 stitches, switching colors about every 10 rows (as is typical for me, I’m not counting rows, but “eyeballing” it). Skills-builder: Moss stitch is tedious when done in American “throwing” style, which is the way I learned and the way I usually knit. I’ve always wanted to learn Continental style, and this is a perfect tutorial – big needles, easy pattern, not too worried about gauge. There are many videos on YouTube that demonstrate Continental Style, generally, and Seed Stitch, specifically. I watched a few as I tried the awkward (for me) style. This project is definitely faster in the Continental Style, but still very awkward for me, and I feel like I’m not getting enough tension (which is why I’m not worried about the apparent under-sized fabric as compared with the pillow form in the picture below). It’s terrific mindless knitting, though, and I’m fascinated by both how Continental Stitch works and that I’m still having trouble with it. Daughter only barely managed to control the eye-rolling when I pounced on her and asked her to model the moment she came downstairs. 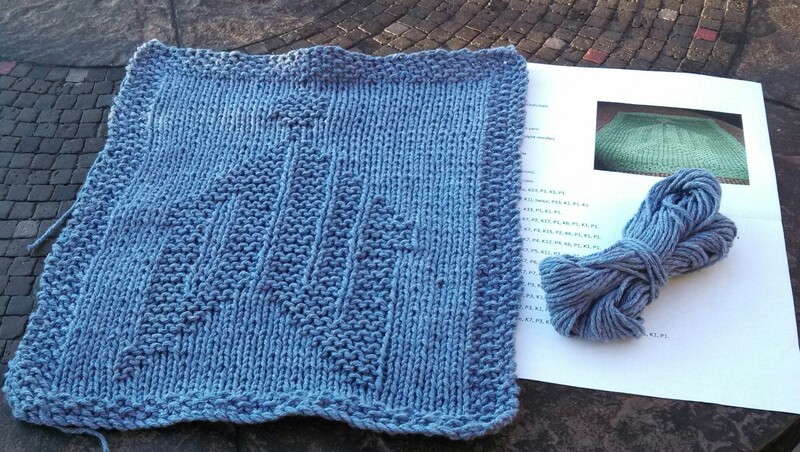 My first adventure in double-knitting, the Nordic Neck Warmer, found in the Creative Knitting, Winter 2013 edition. This will go to my sister, who spends a lot of time outdoors in brutally cold weather. This was a good beginner project for double-knitting. I learned a lot (like, for instance, patience). I wasn’t sure how to bind off, so I checked out a couple of videos. Turns out, there are more elegant ways of edging (Kitchner bind-off, “hidden” cast on and bind-off), but the “braided” look of the simple knit-slip bind off worked well. I found a good video about managing the yarn in double-knitting, from a Continental knitter’s perspective. I was trying to figure out how to speed up the double-knitting process. You can take a look at it here: How to Double-Knit Really Fast. I tried it, but as an American-Irish style knitter, I had trouble managing the tension with the Continental style. Turns out, I was just as quick using my own method of holding the yarns together and using the right needle to select the proper color for the stitch. Liat Gat of Knit Freedom has a great You Tube Channel (to which I am now subscribed), where she demonstrates all kinds of knitting techniques. I recommend that you check her out. This was so much fun and went so fast that there was no casting on or WIP photo. This is the 11th Doctor Who logo – the source design of which captured my fancy when I first saw it. 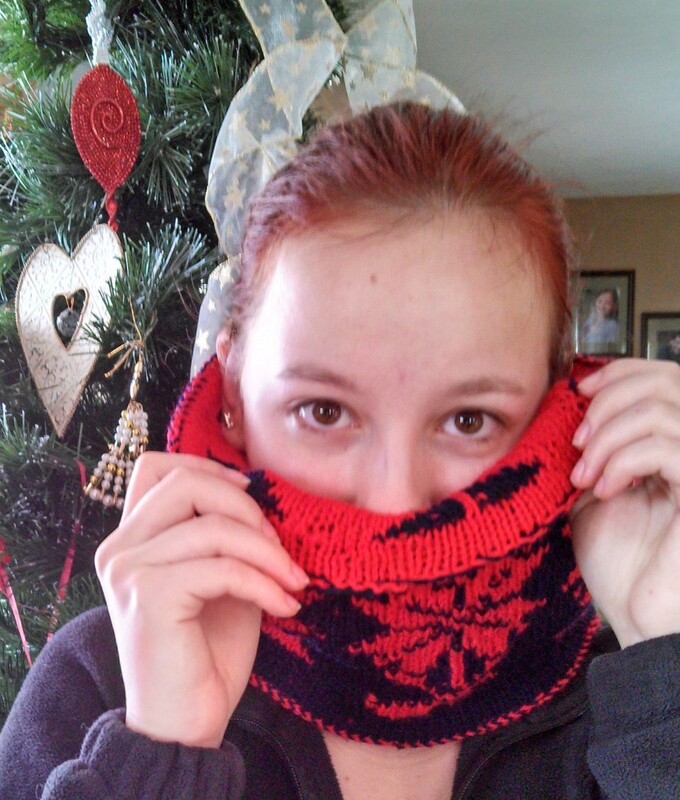 Kudos to knit designer Jenn Bragg for a terrific quick project. (Needs blocked) Daughter #1 said that it needs to be in a different color. Navy might be more in keeping with the theme. A shout out to my friend, Brenda, who is the brainchild behind Indianapolis’ newest nonprofit organization, Walk Urban Indy. The goal of this organization is to provide historic walking tours featuring Indy neighborhoods as a way to promote health and fitness. The launch event is today in McCord Park. You can check out the website and maps. Brenda has done a fabulous job of creating the well-annotated and colorful map of the first route: Historic Watson Park. Check it out, and if you are Indy near the Fairgrounds, stop by for a lovely 1 mile walk. My work has been driving me crazy, so knitting has been a bit beyond my reach. I manage to knit at least a few moments of most days, just to put my hands on something other than a computer keyboard (*BREATHE*). While looking for something else, I ran across this picture of a dear friend, out in his element. 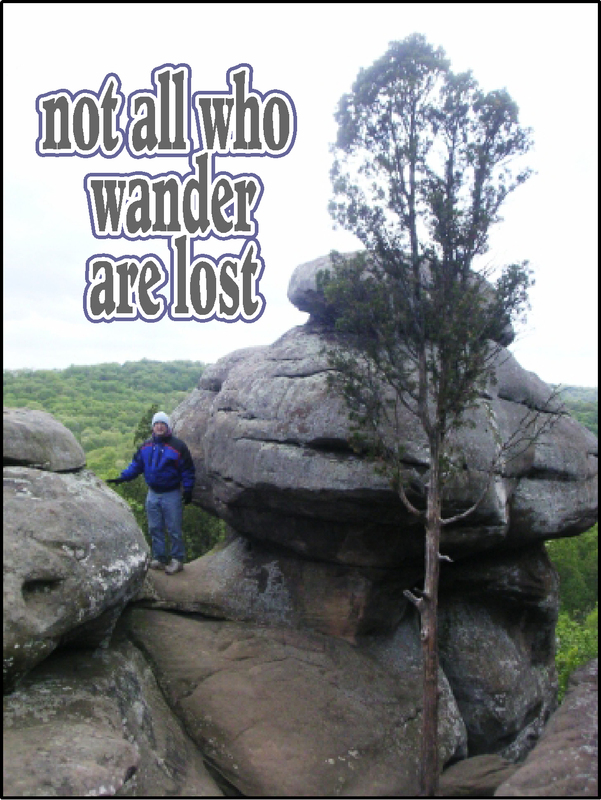 RM is an inveterate hiker, and has made a habit (A HABIT, mind you) of hiking such challenging venues as the Appalachian Trail. He also eschews technology to the extent possible, which make me think that he has way more moments that take his breath away than I do. So, here’s a shout-out to my friend – who may never see this post, but who is my hero of the outdoors. I picked up this interesting varigated yarn in Palm Springs on vacation. I found it at The Yarn Company, a tiny hole-in-the-wall yarn store on Hwy 111 in Palm Desert. There is no website, but you can Google the location and visit if you are ever in Palm Springs. While I did not get to meet the owner, I chatted with the very nice sales lady, who told me that the owner likes to carry a wide variety of yarn styles from all over the world. A lot of different types of yarn, but not a lot of each type. The yarn is stacked nearly floor-to-ceiling. I picked up two kits (which is where I learned that knitting kits were very popular for Christmas) – one of which is reflected in the picture below. I can’t give you more information about the yarn, because it will spoil the surprise. When it’s done, I’ll post a modeled photo and tell you all about it. I think it will look much more interesting when completed. This is my current “knitting while watching TV with the family” project – Does not require a lot of my attention, and I don’t lose my place if distracted by the channel-hopping males or general family discussion. 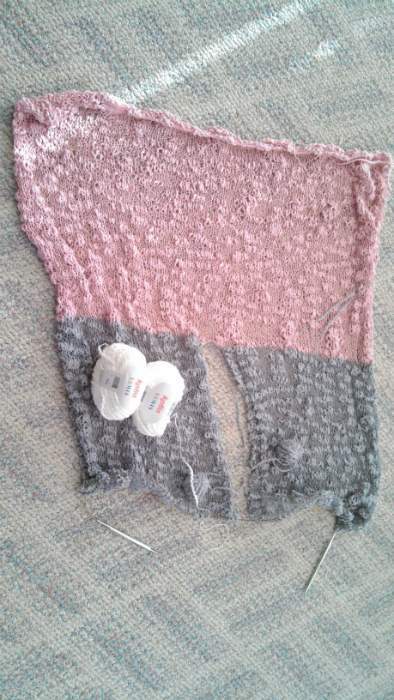 The grey part was frustrating, however – knitting from two separate balls of yarn got them tangled nearly every row.